Drain the chickpeas and rinse well, patting gently with a paper or lint-free towel to remove excess water and stray bean skins, if desired. Toss dry chickpeas with melted butter, salt, sugar, and five spice powder and arrange them in a single layer on a baking sheet. Roast for 40 minutes to an hour, shaking the pan and testing occasionally, until chickpeas are crisp and golden, and no longer soft in the middle. 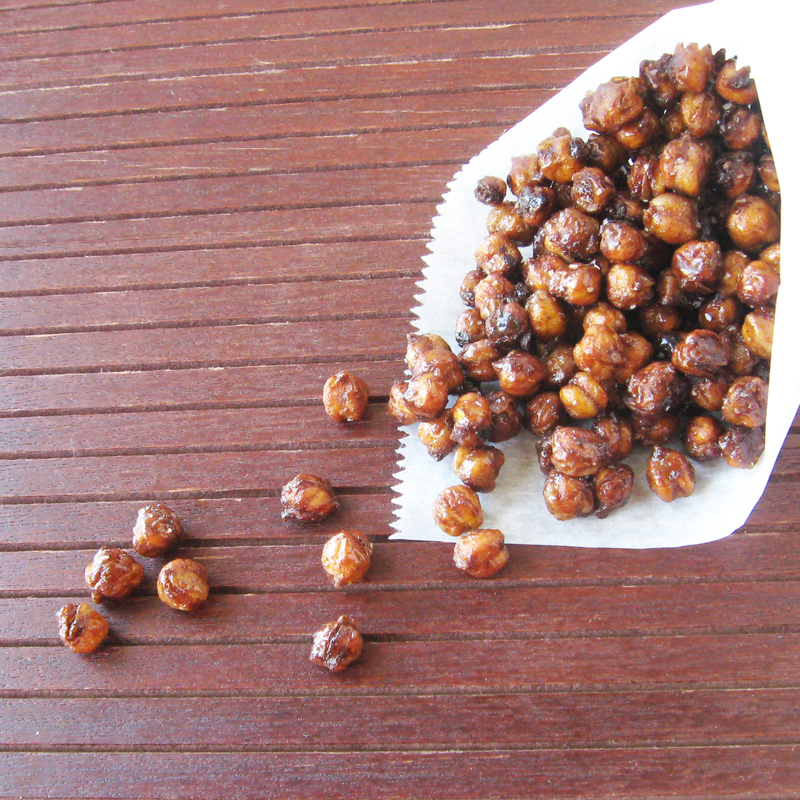 Place hot, roasted chickpeas in a small bowl and coat evenly with honey. Spread chickpeas back out on baking sheet and allow them to dry. Thanks for this great alternative snack idea! I made the recipe, but I found the oven temperature too low at 350 degrees, so after 45 minutes the chickpeas weren't crispy or done. I had to increase the oven temperature to 425 for an additional ten minutes to get the chickpeas to the texture they should be. 1) Home ovens tend to operate with variables, so knowing your oven, and whether it runs hot or cooler than normal, is key. 2) The drier the chickpeas are, the faster they'll crisp up. So, make sure they're as dry as possible. 3) The key to this recipe is low and slow with regard to temperature. Sustained higher temperatures will caramelize and burn the sugar, resulting in a bitter end product. So, keeping the heat as low as possible, and increasing the cooking time as needed, is important. This looks like something I would like to try. What is 5 spice powder? I am in very rural Nevada but two of my kids are going into Reno this weekend so maybe I will bug them to pick me up some at WholeFoods Market or somewhere.